AVANI Riverside Bangkok Hotel is approximately 1 hour from Suvarnabhumi International Airport and approximately 45 minutes from Don Muang Airport. Our hotel limousine services from both airports are easily arranged through the hotel. Public taxis are also available from the pick-up counters at the airport. Public transportation from the airport is available by connecting to the BTS skytrain from the Airport Rail Link. 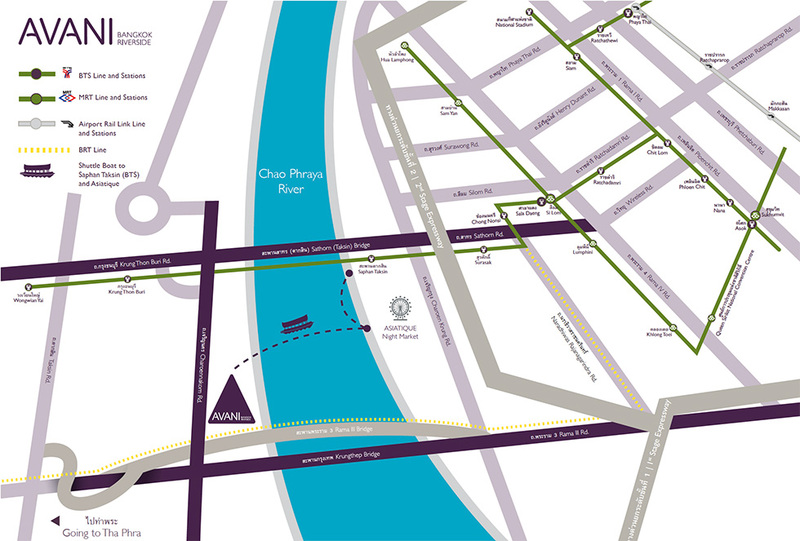 AVANI Riverside offers complimentary return boat transfers to Saphan Taksin and the hotel, conveniently connecting to the city and 5 minutes to Asiatique. The hotel’s tuk-tuk service is a novel way to experience this fascinating city and is available upon request for transfers from the hotel to BTS Skytrain at Krung Thonburi. Bangkok has a tropical climate, similar to other parts of the country. From November to February, temperatures range from 18 to 32 degrees Celsius in Bangkok. The summer period is from March to June with the average temperatures in Bangkok within the range of 34-40 degrees Celsius; whereas the hottest period is in April. From July to October, Bangkok experiences the annual rainfall. The best time to travel to Bangkok is between October to February when the temperatures and humidity are not as high, which makes it favourable for touring around this City of Angles. Night-time temperatures in December and January can be in the low 20s and this is the best time to experience the beauty of the River of Kings as the skies are clear.